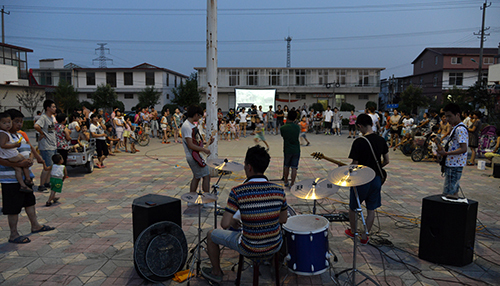 July 5 evening, some of our college students went to LoudiTown--Party practice education base, to carry out the practical education by giving a party with the local villagers in Wang jiatun activity square. The choreographed program prepared by "free" society and "hip-hop community" won bursts of applause of the audience. Dozens of children danced with the dancers. The atmosphere is very hot. The wonderful programs and exquisite performances fully demonstrated the college student party members’ youthful style. The performances condolences opened the prelude of our students carrying out practical activities. Beginning from July 6, 10 students and activists will give classes to elementary students, while "Farmer evening school" also have classes. “Farmer evening school”is an innovative and highlights of the practice in this summer. They will teach local villagers how to use computer to go on the internet, website design and maintenance.